Waxing removes hair from the root, so takes hair longer to grow back, leaving you fuzz free for longer. The hair which grows back is finer and softer, unlike the rough, hard hair you get after shaving. 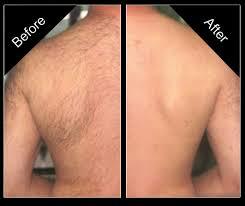 After repeated sessions,you will notice that the hair growth is more sparse than if you continued to shave. This is because shaving stimulates hair growth, because it removes the hair at the surface only, not at the root. As there are no harsh chemicals in wax, the skin is saved from their damaging effects. Waxing also does not cause cuts, pigmentation or bad smelling skin. Waxing leaves the skin soft, smooth and rejuvenated because it removes a layer of dead skin cells, thus indirectly serves the function of exfoliating the skin aswell. I use a tea tree wax or honey wax for my treatments. Tea tree is especially good on the face as it's more gentle on the skin and any redness will reduce even quicker. A hairy back is never a good look for men, so let me make it fuzz free in 30 mins. Using Tea Tree roller wax to make the process as gentle and quick as possible.